The single will appear on Park’s Ask ’Bout Me EP, due out in July. When Jay Park signed to Roc Nation last year, the move signaled a crossover for the singer, songwriter, and rapper. A Seattle native, Park has long been a star in South Korea: first, as the leader of boy band 2PM and, then, with his four-album deep solo career. Now, he's returned with the video for his latest single "SOJU," which premieres on The FADER today. The uptempo new track features 2 Chainz and celebrates Korea's most famous alcoholic beverage. In the video, directed by Elliott Sellers, Jay Park and 2 Chainz take over a Korean restaurant before the party moves to the parking lot. "Hope everybody can appreciate the mixture of cultures and I hope y'all enjoy the SOJU MV," Jay Park told The FADER over email. 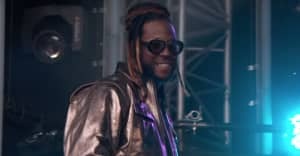 "It was a learning experience for me, got introduced to the world of Korean culture and so much more,” 2 Chainz added about the video.